We were lucky thus far not to have been hit with downpours of rain considering June and July are the wettest months for Alaska and Yukon Territory. But today our luck ran out. After reaching the Alaska border along the Alaska Highway, the wet stuff came down, and came down hard. It remained that way until we reached the city of Tok, about 75 minutes later. At that point, we opted to stay the night. It's still raining as I type this. 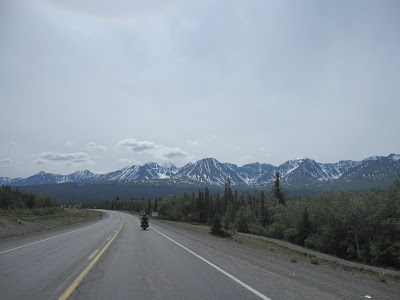 Today's ride was all along the Alaska Highway. 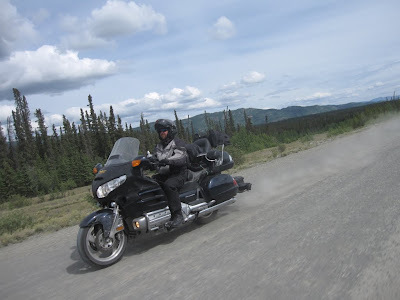 We did a stretch of about 520 miles between the Big Creek Campground and Tok, AK. The highway was quite scenic, pretty much in the same character as most other Canada highways, with snow-capped peaks, lakes, streams, and millions of trees. The road itself is largely straight, with some wide sweeping curves. I'd hate to mention the curves because it might make you think it's fun to ride. But these curves are so wide that it doesn't even warrant putting your hands on the handlebars. Instead these roads are about the scenery, and you get lots of it. 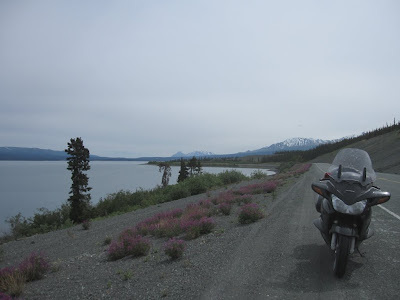 There was this very beautiful stretch of road along Kluane Lake that forced me to stop and take some photos. As we got closer to the Alaska border, we found the road ravaged with frost-heaves. This is where the frozen ground pushes up the asphalt and creates cracks in the road, which eventually break down and turn into potholes. This caused us to slow down and lose time. And then there were several stretches along the Alaska Highway that was just hard packed dirt with a layer of loose gravel. Some stretches were only 2 miles long, though the longest was about 10 miles long, which ran to the US Border. Who needs a BMW GS when a Goldwing will do? And when reached the US Border, the dirt road continued on, except the US Government uses much larger chunks of gravel and in a thicker layer, making for some hairy riding on my sport-touring tires. I was just glad we managed to get through it all before the rain came down. And now here in Tok, AK, it's good to be back in the USA, where they transact in US Dollars, the mileage signs are in miles, and they price gas by the gallon. One thing I noticed in Canada, is that they don't take American Express. I guess a few places do, but most places don't. I didn't exchange any US dollars for Canadian, so I've been paying for stuff on my Master Card. The only decent-sized town we rode through was Whitehorse, YT. It's actually large enough to warrant a McDonald's, as well as two (count 'em TWO) Tim Horton's. 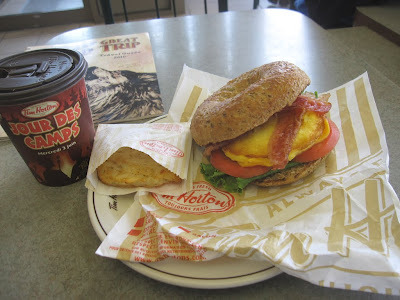 Tim Horton's is a Canadian thing. It's fast-food, but more like breakfast food, serving coffee, donuts, bagels, and breakfast sandwiches. I had a breakfast sandwich on bagel, with a hashbrown and coffee. It's was pretty good, actually. Actually, I love stopping at little bars and cafes and getting to know the people there, and we saw lots of this stuff here. 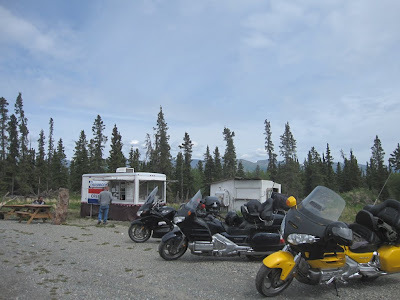 We stopped at a little burger shack out in the middle of nowhere, along Kluane Lake in Yukon Territory. I didn't eat anything, but Mike had a buffalo burger while Paul took in a chocolate shake. The gal running it had a hip replacement last May, and needed a way to earn a living without having to work a regular job. So she drug a trailer out here and set up shop. She's hoping to capitalize on motorcycle riders traveling through Canada. Animals I spotted today: a fox and a bald eagle. They have Tim Horton's in the state of Rhode Island and they are pretty good ... but they're having a hard time competing with Dunkin' Donuts, which is #1 in R.I. ... practically one at every major intersection.